GOROKA, Papua New Guinea , Apr 29 2012 (IPS) - Sexual harassment of school-going girls is one factor that may prevent this Pacific island nation from achieving the Millennium Development Goal (MDG) of eliminating gender disparity in education by 2015. Papua New Guinea (PNG)’s new free education policy has dramatically increased school enrolment, and a gross enrolment rate of 80 percent is within reach by 2015. But the third of the United Nations’ eight MDGs, that pertaining to girls’ education, remains elusive on current trends. 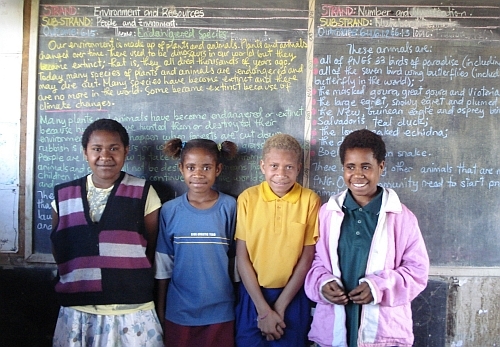 While PNG’s constitution promotes equal participation by men and women in national development, political, cultural, social and infrastructural factors inhibit retention of girls within the school system, reflecting a wider lack of women in the formal workforce, governance and decision-making roles. The United Nations Development Programme rates the nation at 153 out of 187 countries, with a gender inequality index of 0.674. The education department reports the average educational attainment of girls is grade 10 and, for boys, grade 12, the final year of secondary school. However, the nation’s cultural and social diversity means there is geographical variance. In the Autonomous Region of Bougainville, where matrilineal societies are prevalent, there are 16,821 male and 16,120 female school students. In the Eastern Highlands Province, the literacy rate for males is 51 percent compared to 36.5 percent for females. There were 7,127 male and 5,872 female students in primary level grade three in 2009. In grade 12, the number of female students, 180, was less than half the male enrolment of 494. In the highlands, where most people practice subsistence agriculture and the average cash income is low, girls can be particularly disadvantaged, especially if there are no local schools. “The (poor) state of school infrastructure, particularly in rural areas, is a significant hindrance to the achievement of equitable education outcomes,” said Arnold Kukari, leader of the universal basic education research programme at the National Research Institute. Girls in PNG are at high risk of domestic and sexual violence, sexual harassment in schools, commercial exploitation and HIV, which pose serious threats to their health and education. Wainetti said many of the young girls interviewed by FSVAC, an NGO based in the capital of Port Moresby, were already mothers. Cultural and social barriers to education include the burden placed on girls of family care, domestic responsibilities and customary marriage, which can occur from 12 years. The International Centre for Research on Women (ICRW) estimates that a third of girls in the developing world are married before 18 years and begin child-bearing before 20 years. The education department’s gender equity strategic plan (2009-2014) stresses the need to develop gender mainstreaming activities in schools and train all staff in gender sensitisation and sexual violence awareness. Philip Afuti, president of the PNG teachers’ association, Eastern Highlands, and head teacher of North Goroka primary school, is committed to gender equality. Eighty percent of teachers are female, while the school has 630 male and 523 female students. This year, the national government rolled out a free and subsidised education policy, which has impacted female enrolment. Students attending elementary prep to grade 10 at secondary school do not have to pay tuition fees while those in grades 11 and 12 pay only 25 percent of fees. But there is a limit to the expansion of the education system. “The government has taken a bold step to abolish school fees at the basic education level, thus addressing a critical access barrier, enabling more children to be enrolled and complete a full cycle of education,” Kukari explained. There are also inadequate mechanisms of support for school-going girls suffering from sexual abuse. “If there are avenues for redress to such offences, these are not made known to students and parents,” Wainetti said. “It is unfortunate that many teachers will not do anything about these abuses until the parents of the girl or boy turn up at the school to beat up the students who have been harassing their child,” Wainetti said. Betty Hinamunimo agrees that, in rural communities, women working as literacy teachers are being valued more in the community and respected, and as role models they are contributing to changes in community attitudes and greater support for educating daughters.